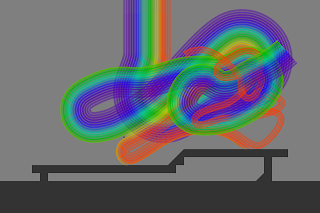 Last night, after some profiling under iOS, it became clear that the method of drawing rainbows that I discussed in my previous post was going to be too heavy. Basically, the nice curve-y geometry of Rainbow's rainbows just contain too many vertices for my iPhone4 to want to render every frame at 60fps. So, this morning, I revised the drawing code again, this time to accumulate into a framebuffer. This means that the actual amount of bow geometry rendered each frame is quite small, in exchange for the (large) fixed overhead of a full-screen blend. As an added bonus, when two active fronts overlap, the resulting bow is nicely blended (something that no other method I've come up with can achieve). Unfortunately, this method limits (somewhat) the kind of graphical effects the game can perform. E.g., it can't fade out an entire band that hits a wall, or animate bands along their length. Rather, it could do these things, but I'd have to change the drawing method again, and sacrifice transparent bands and smooth mixing, or pay for another full-screen blend which -- it seems like -- the game can't really afford.